Summit participants agreed use this session for Action Team discussion & planning, and to add one final session in April to present plans and celebrate their accomplishments. 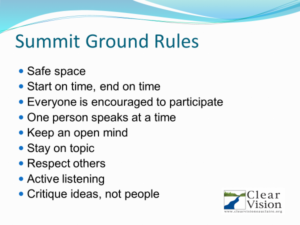 Two short, but very important, reminders are included at the beginning of each Poverty Summit session: Ground Rules and Community Contributors. Ground Rules help to ensure that the Poverty Summit is indeed a safe and welcoming environment and that all participants are treated respectfully. 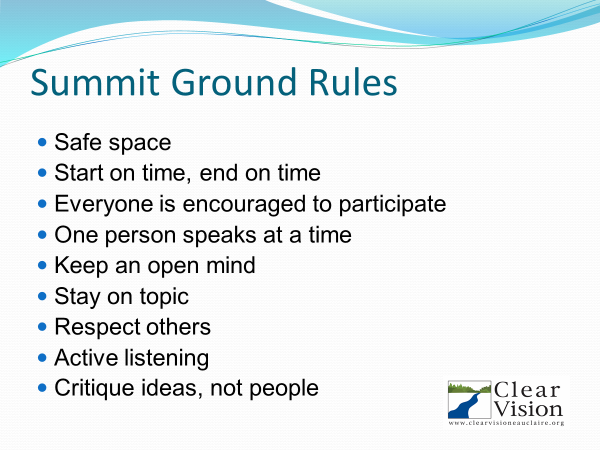 These Ground Rules are posted at each Summit session and mentioned within opening remarks. Local businesses and organizations made in-kind or financial donations to help support the Eau Claire County Poverty Summit. Donations from COMMUNITY CONTRIBUTORS helped facilitate the eight Summit sessions, will support the work of the Action Teams through seed/support monies as they implement plans, and will allow Clear Vision to document the Poverty Summit process and results so other communities with a similar concern can replicate this important community initiative. The Poverty Summit launched in October 2016. Since then, 274 citizens have joined in the conversation about issues related to poverty and income insecurity in Eau Claire County. Nine Action Teams formed. On April 6 these teams will unveil their Project Charter Statements and major points of their Action Plans. Following the brief presentations, they will celebrate! The Poverty Summit is now transitioning from the Planning Phase to Action Plan Implementation. Teams used the rest of Session #7 to work on their action plans and discuss organizational issues for moving forward. CONFIRM CO-CHAIRS — Each team is encouraged to confirm two co-chairs. Co-chairs will coordinate Action Team agendas and schedules, and help members use Clear Vision skills to develop and implement their action plan. Co-chairs will also participate on the Coordinating Committee and play a vital role in ongoing communication between teams. 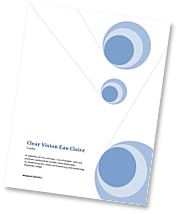 SET REGULAR MEETING SCHEDULE — Clear Vision encourages Action Teams to set a regular monthly meeting. A scheduled meeting time makes it easier for team members to plan, and helps as teams recruit new members. PREPARE SHORT PRESENTATION FOR APRIL 6 — Teams will present their Project Charter Statement, key goals from their Action Plan, and a Next Major Accomplishment they will complete by June 30. ACTION TEAM RECRUITMENT — All teams will want to recruit new team members. Ongoing recruitment helps replace members who leave, as well as add new expertise and energy as the team implements their plan. Each Action Team wrapped up their discussion with their PUBLIC EVALUATION, that word or phrase that describes how each person felt the evening went.